When someone says Mike Isabella you likely think of pepperoni sauce, killer pizza, maybe even spit-roasted meat. 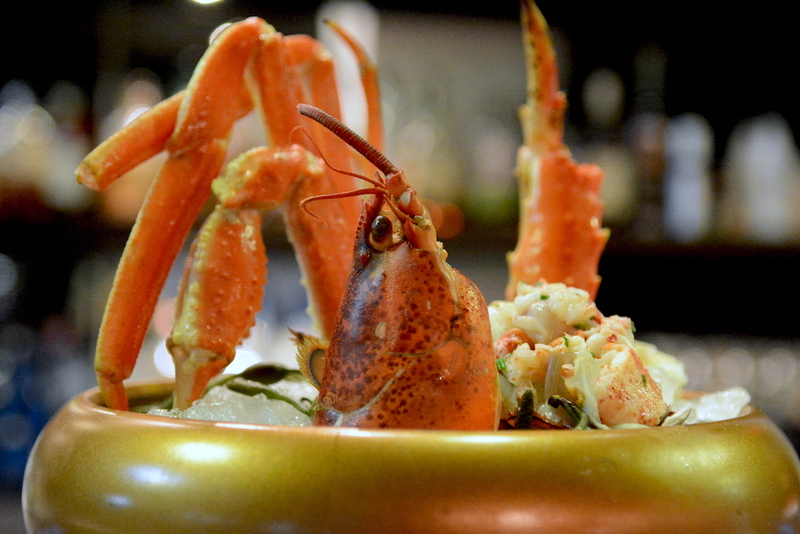 But, thanks to the addition of Kapnos Taverna, Mike can add seafood to his growing list of culinary sorties. 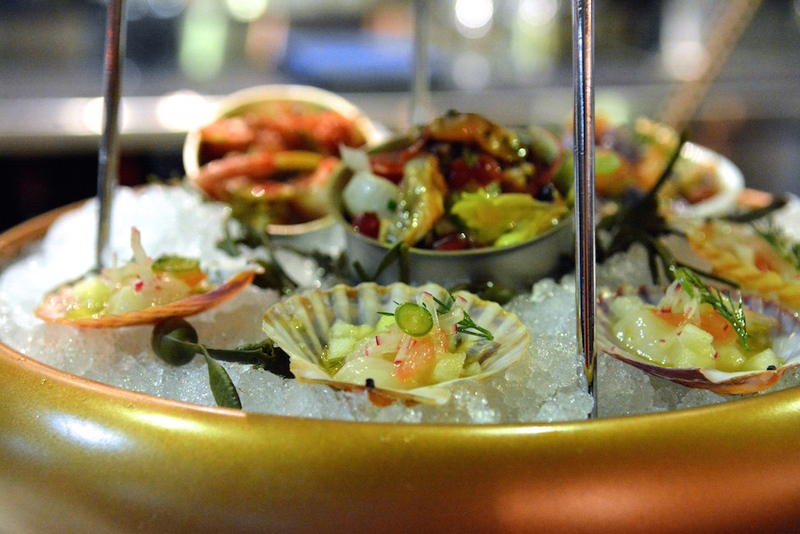 The biggest differentiator between Ballston’s shiny new Kapnos Taverna and the 14th Street original, Kapnos, is the addition of a raw bar that cranks out seafood towers and platters that can compete with the likes of Fiola Mare and Le Diplomate (yea, we said it). For reasons that will soon become obvious, the magnanimous seafood tower with its bounty of ocean critters and house made condiments is the Best Thing on the Menu. It’s so impressive that we’re breaking it down by tier. Warm up on the first floor where things are pretty familiar: shrimp that have been sexed up by some kind of tangy yogurt sauce and an array of oysters divided by West Coast and East Coast. Boost their briny flavor with harissa hot sauce, tomato-ouzo cocktail sauce, lemon yogurt, mignonette or fresh horseradish. The Taylor Bay scallops made zippy by apple and grapefruit steal the show in tier two, though the marinated mussels accompanied by celery, preserved lemon and pomegranate bring competition. Also served in small metal vats are king salmon tartare with purple potatoes, mustard and cucumber as well as tender octopus with eggplant, red pepper and olive. 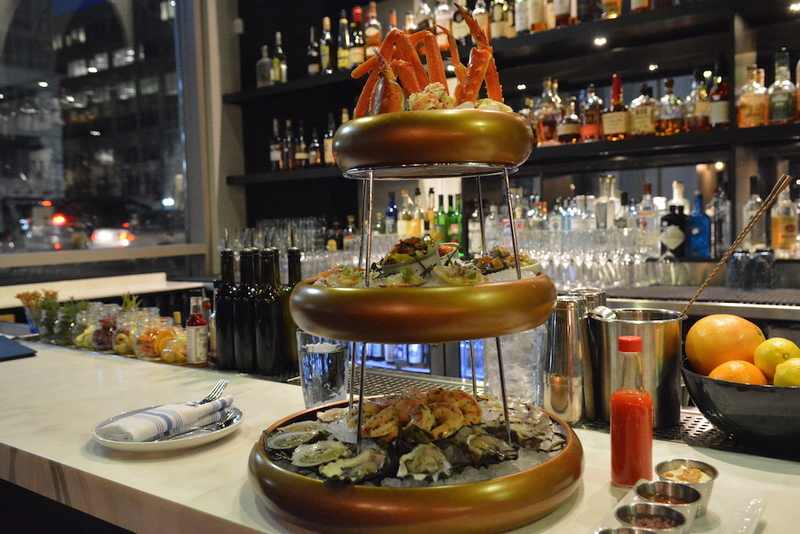 Finally, like a lady wearing a whacky hat at a horse race, lobster and crab form the dramatic crown of the tower daring you to take on the work that goes into cracking those crab legs. The whole thing weighs in at $125, but if you bring a team of four it won’t break the bank. All you’ll need to leave feeling full is a few dips and spreads that come with flatbread or maybe some vegetable mezze like Greek spiced potato fries or fried burssels with lemon, pomegranate, dill and garlic yogurt (reminiscent of he Best Thing on the Menu at Zaytinya). Kapnos Tavern is located at 4000 Wilson Blvd. 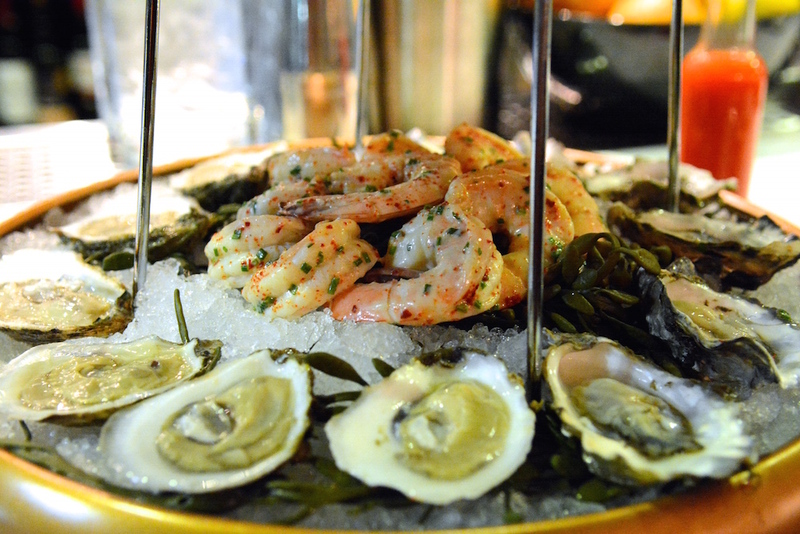 Seafood tower not your BTM? Share your favorites in the comments section. This entry was posted in Restaurants and tagged Ballston, Kapnos Taverna, Mike Isabella, Seafood Tower. Bookmark the permalink. You might want to look up “magnanimous” in the dictionary. I do not think it means what you think it means. Thanks dictionary police. The word’s many meanings including “generous in spirit” and “indulgent” are exactly what we were trying to get across.